The Occupational Safety and Health Administration (OSHA), the agency for enforcing workplace safety laws, provides standards to protect workers from possible dangers at the workplace. For the construction industry, one of those protections is the OSHA standards for wearing a hard hat. According to the OSHA 1926.100(a) standard, "Employees working in areas where there is a possible danger of head injury from impact, or from falling or flying objects, or from electrical shock and burns, shall be protected by protective helmets." The "Duty of Care" principle means companies need to plan for the prevention of accidents at worksites. Under this standard, an employer must initially evaluate the activities of its employees and the surrounding activities on the job site and determine whether these hazards require the need for a hard hat to be worn. Employees who are obligated to wear a hard hat can be penalized under OSHA regulations for failing to wear the hat. OSHA relies on the American National Standards Institute (ANSI) Z89.1-1997 guideline for compliance regarding hard hats. This ANSI statute recognizes three classes of hard hats, each which must withstand blows to the head and exposure to a variety of electrical impacts. The head wear must be tested for penetration, flammability resistance and water absorption. Three optional test criteria are used by manufacturers of protective helmets based on ANSI Z89.1-2009. Reverse donning tests measure performance whether the hard hat is worn frontward or backwards. Low temperature tests show whether the hard hat meets perfomance requirements to -30º C (-22º F). High visibility testing indicates the hard hat meets requirements for high visibility colors. In 1978 OSHA provided an exemption from wearing hard hats for employees who are members of the Old Order Amish or Sikh Dharma Brotherhood religious communities. In 1993, the Religious Freedom Restoration Act created OSHA standards for wearing a hard hat for employers and employees with specific personal religious convictions. In such cases, the employer will not enforce wearing a hard hat, will instruct workers about the hazards of not wearing a hard hat and will contact OSHA. Grundstom, Toni. "OSHA Standards for Wearing a Hard Hat." 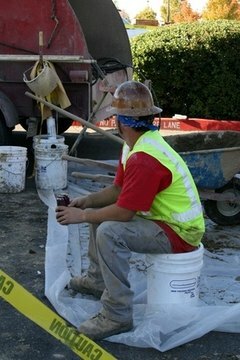 , https://legalbeagle.com/6303855-osha-standards-wearing-hard-hat.html. Accessed 20 April 2019.